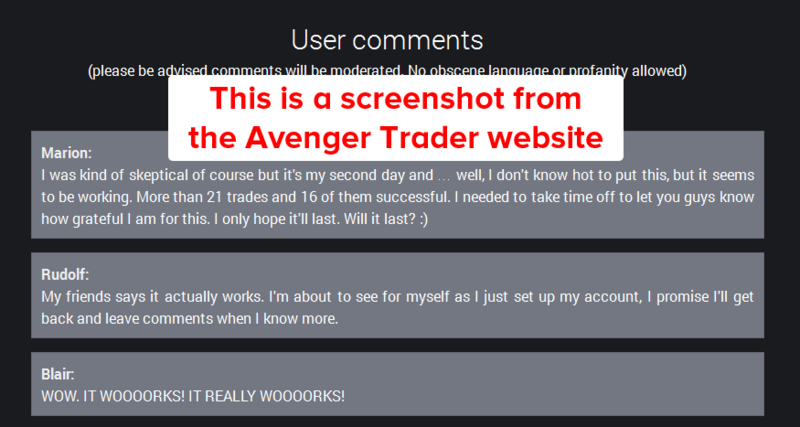 Avenger Trader Review – Is It A Scam? 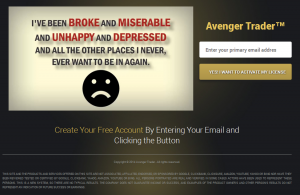 Welcome to my Avenger Trader review, one of the latest systems that says it can help us become financially independent & live our lives the way we dream. It sounds good and I bet pretty much everybody would like some extra money in their lives right? The real questions is though does it actually work & can it really help us out? I’m back once again to find out & to discover whether this system’s really going to help us out or just leave us even more broke than we started out. In case you’re wondering what it’s all about & how it’s going to supposedly make us money, this is another binary options system that claims to have cracked the code of profiting from trades. I’ve seen a lot of these surface lately, the majority have been rubbish, some have been promising & this one… well let’s see where this one is going to fall. To be honest before I go ahead & get deep into this review I just want to let you know that I’m not a great fan of binary options in general. As much as there may seem like there’s logic behind it, at the end of the day it’s still just a gamble. It doesn’t matter what length trades your doing there’s no science behind it & nobody can guarantee whether it’s going to go up and down. Anybody that tells you they can guarantee a trade is simply lying because think about it – none of the brokers would be left in business. There’s much much better ways to make money online, but since you’re already considering binary options I’ll jump right in and take a look at this system. Upon first glance the system seems OK, it’s not throwing fancy yachts, big mansions or flash cars in our face like the majority of other binary options systems do & there’s nothing pressuring us into entering our name & email. To be honest there’s actually no mention of money on the website which is probably a first from all the binary options systems that I’ve come across – usually they try and tell you how they can make you $5,000 a day etc and make all sorts of ridiculous claims. The video goes on to say that the creator has been struggling financially in the past & wants to share his secret because nobody should be suffering from a lack of money when there’s so much around. He sounds really genuine & whether it’s true or not he makes it very easy to connect with him. Another great thing about this site is that it actually shows you an insight into the system itself in the video before you’ve entered your email. Most systems I’ve come across lately have been hiding absolutely everything until you’ve gone ahead and made a deposit with the broker. Unfortunately I’ve been stung a couple of times and found out that after doing just that there wasn’t actually any software at all & the owner didn’t care because by that point they’d already made a commission from referring you to the broker – not good. So at least here at Avenger Trader it does actually look like there is some software available. In the video on the homepage he goes on to show you the software in action & speeds it up so that you can see a quick overview of all the trades. Whilst he’s recording all the trades do win – but whether or not this is legit who knows. It’s certainly fairly reassuring at least though & he does come out openly and say that the system won’t win trades all the time, but lost trades don’t really matter as you will eventually balance out into a positive over time. He also mentions that the system is fully automated so it doesn’t require your input whatsoever, however if you would like to interfere then you are able to using the manual controls. According to the Avenger Trader website this software works by mimicking the software that the brokers use for controlling the price of assets that you trade on their websites. That certainly seems pretty fair, and potentially sounds like it could work. He then goes on to mention though that it won’t work equally well with every broker but it will of course work with the broker they recommend (doh, is this another one that’s only interested in a commission?). To be honest, I’ve got to give it to them – if a piece of software works and makes me money then I’d be more than happy to sign up with their recommended broker & earn them a commission purely as a thank you. The site claims that the broker will never know your using a robot because the majority of people trading are actually using robots themselves. To be honest I personally think the broker would get pretty hot on you if you’re using a system that’s winning pretty much every trade. Initially they might put it down to a fluke but if you’re continuously using it then they’re going to sense something is going on. I have to say that compared to the majority of systems I’ve come across this one does come across fairly genuine & the methods it mentions could potentially work. I haven’t personally tested them out to see if it walks the walk or just talks the talk but the theory sounds fairly reasonable. Inside the members are there are some video testimonials but in my opinion these don’t look too convincing. There’s also some “member comments” but I found it strange since there’s no box where you can actually leave a comment yourself. All of the comments on that page are positive & the worst one I came across was “Sometimes it is working and sometimes it not working :(” however it does mention that these comments are moderated so even if they are from real users the negative ones will have probably been removed. I won’t be recommending this system right now simply because I haven’t tried it out, but I have to say out of all of the binary options systems I’ve come across this one does appear to be up with “the more genuine looking ones”. Lately I’ve been seeing too many systems that have just been throwing dreams at you to try and get you to part with your money & this one has at least brought something different to the table in that sense. If you’ve used this system yourself then I’d love to hear what you think & most importantly whether or not it worked out for you. All you need to do is scroll down and leave a comment below this post – it’ll not only help me but it’ll also help other readers that might be considering depositing some money & using this system. Is DollarZip.com a Scam? Heck Yes! Read My Review Before Signing Up! Agora Financial – Scam or Legit Company? Their Reviews Might Surprise You!